See if you can pick 'em like Peyton. Before I get to the important stuff, I just wanted to spread the word about the Blue Duck Pick ‘Em league on Yahoo fantasy. Its just a normal office-pool type pick ’em league, and its free. Beat the “experts” and embarrass us week in and week out. League starts up week 3, but sign up now. At the end of the season the winner will get an official Blue Duck T shirt. Anyone can join. The more the merrier. The Group ID is: 64754, and the password is: bigblueduck. Good Luck. 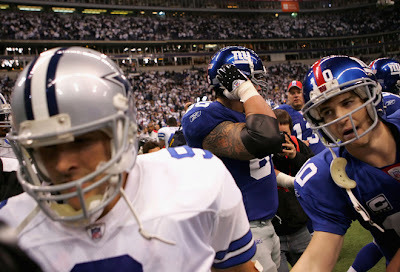 New York Giants @ Dallas Cowboys. This is pretty much a no brainer as the game of the week. Giants/Cowboys is always a big game, but now that the ‘boys are opening up the giant spaceship that Jerry Jones has parked out by the Ballpark at Arlington, this matchup gets even better. I just moved to Dallas, and the city has been abuzz for a long time over this one. The Big D is ecstatic that they got rid of T.O., and even more excited that they get to christen the new Mecca of pro sports on Sunday. But Dallas probably feels like a high school team that scheduled a tough opponent for homecoming. The NFC East is probably the strongest division in football. On any given Sunday, any one team in the east can take out any other team so this game can really go either way. Here are a few keys. The Giants are pretty banged up. DT Chris Canty has been ruled out, but the Giants have some depth on the D-line, Hakeem Nicks is out, and a couple key guys in the secondary are questionable. The secondary being shorthanded may be an issue here as Tony Romo lit up the Bucs last week for 353 yards on only 16 completions, and always seems to play well against the G-men. Patrick Crayton, Miles Austin, and Roy Williams all had long receptions. If the Giants can keep the passing game in check, they should take this game. These two are friendly postgame, but Sunday should be a battle. The Giant’s offense will have to rely again on that no-name receiving corps we saw last week. Eli hit 7 different targets en route to their “not as close as the score made it look” win against Washington. The Post-Plaxico Catching Team looked good, and who knows, maybe the lack of egos from receivers makes Eli more comfortable. 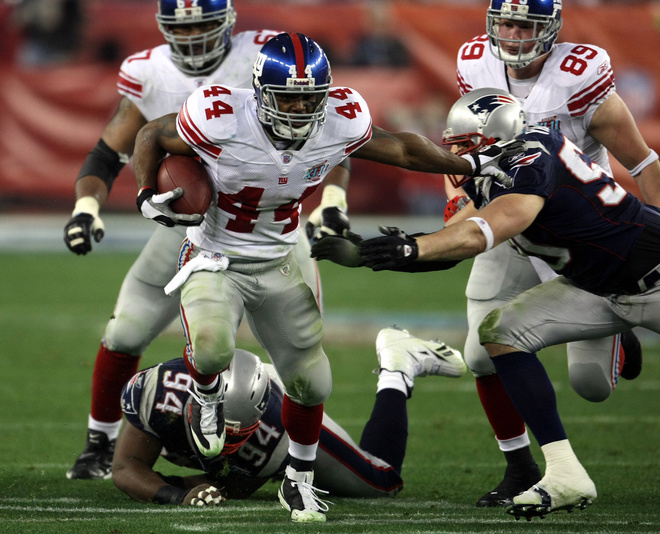 Ahmad Bradshaw led the Giants in rushing with 60 yards, and look for a big game out of him. Teams prepare for big Brandon Jacobs, and the quick and nimble Bradshaw is a huge change of pace, but quick and nimble does not necessarily mean soft, as Bradshaw’s runs more often end in refs blowing them dead, than with Bradshaw being brought to the turf. My Prediction: Giants get lit up a few times on big passes, but control the run. Eli has a mediocre, but effective game, and the Giants open up the 8th Wonder of the world with a 31-27 victory. Seeing the look on Jerry Jones face when Jeff Feagles peppers the scoreboard throughout the billion dollar cathedral’s opening act. Drew Brees and New Orleans cruise into the City of Brotherly Love, riding high after a 45-27 victory over the Lions. The Eagles were no slouch last week, beating Carolina 38-10, most likely losing QB Donovan McNabb for this week’s tilt in the process. While we may not have McNabb under center for a big NFC matchup, this game is still must watch TV. Drew Brees looked like he was playing a game of Madden out there last week, tossing 6 touchdowns. This week is important, because we’ll see how he fares against one of the best passing defenses in football. The Eagles secondary added another nail to the Jake Delhomme coffin last week, and didn’t just seize the opportunity against a bad quarterback. Asante Samuel is a premier cornerback and Sheldon Brown is solid as well. Another advantage for the Eagles is that they are extremely deep in the secondary (Hobbs, Hanson, Harris, Jones, and Demps). This is the perfect test to see how unstoppable the Brees-led aerial assault really is. With McNabb, the Eagles are a playoff team (a successful playoff team? God no). All signs are pointing towards a Kevin Kolb-led Philadelphia offense. My magic eight ball says “outlook not so good”, even considering the Saints D allowed 27 points to the Lions last week. Kolb has been absolutely miserable in limited relief of McNabb. In 45 career attempts, he has thrown ZERO touchdowns, four interceptions, fumbled three times and taken four sacks. Newly signed Jeff Garcia knows the offense and should be available as insurance, but he can’t be expected to have his timing down with the receivers. The Eagles need to be counting on Brian Westbrook to be Mr. Everything out there on Sunday, or else they are going to be praying that Kolb gives them something. And I wouldn’t count on much, even with the weapons he has at his disposal. 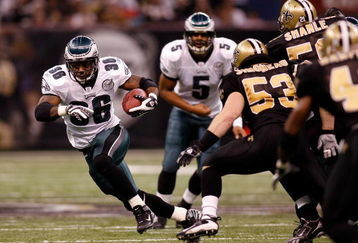 Expect a heavy dose of Brian Westbrook against the Saints on Sunday. Kevin Kolb doesn't offer much promise if McNabb can't play. Bottom line: This game is more about seeing the Drew Brees Show versus the Mighty Eagles Secondary than anything else. I don’t care who wins or loses, or about the final score for that matter. I just want to see the battle between an unstoppable force (Brees) versus an immovable object (Asante Samuel and Co.). For me, I’d love to see Garcia come in and light things up, just to add more pressure to McNabb’s shoulders. He’s got the inevitable Michael Vick threat one week away already, and I think it would be all the more amusing to see Garcia throw his hat into the ring of possible QB contenders. He was already a fan favorite in 2006, and McNabb has never seemed to have the fans behind him in Philly. I want to see how the three-headed quarterback headache turns out if Garcia has a good game. Maybe the stress will cause Andy Reid to stop eating, something the rest of the starving world will appreciate, as well as his cardiologist. My prediction is that the Eagles defense will give Brees his toughest test he will see all year, but it won’t be enough to overcome the Kevin Kolb doom that is sure to ensue. Brees will toss a couple touchdowns and Brian Westbrook will put on a show, but the Saints will pull it out, 24-17. At Press Time, Andy was seen sitting at Gung Ho, yelling at Jimmy about how the Pats are “a better version of the unstoppable 2007 team.” Maybe he’ll get a must watch up before the games Sunday. We shall see. The Cowboys have beaten the Giants 4 out of the last 5 regular season meetings. We'll have to see if Dallas' passing attack is for real or if the Giants front 7 can get to Romo first. Last week started another great NFL season and it offered everything we’ve been waiting 9 months to see. We had blowouts, tight games, stunning individual performances and great team efforts. The Broncos even gave us a thrilling end to a tight game, when Brandon Stokley came away with a tipped pass at the end to score the game winning TD. The Jets introduced themselves as possible contenders, behind solid play from rookie Mark Sanchez and a stout defense. This weekend promises to offer more excitement, so let’s take a look at one interesting game – from A Fantasy Perspective. The Giants travel to Big D to open Jerry Jones behemoth of a stadium, this Sunday in Arlington. Over/under on punts that hit the board: 1.5 for Jeff Feagles. I’m almost certain that the Cowboys Mat McBriar is under strict orders from the man upstairs to avoid the massive scoreboard at all costs, punishable by death. But the new stadium and 60 yard HD screen at Cowboys stadium isn’t the only reason to tune into this game, as it also offers some important fantasy insight as well. Barber should be used quite a bit, in an attempt to stifle the Giants pass rush. Marion Barber (RB) Dal – Barber was quite productive last week (14 car, 79 yds, 1 td, 5.6 yd/car) against Tampa Bay. Talks of him sharing the ball with Felix Jones (six) and even Tashard Choice (two) are a bit overblown at the moment, as they were nothing near a committee last week. Given how productive Barber was, it’s a great sign that he’s finally healthy. This week, he faces a big time defense in New York. Everyone knows about the Giants pass rush, which is why I think Barber is a good play. He can grind out the tough yards between the tackles and Jason Garrett is going to have to slow the game down a bit to keep some of the pressure off of Tony Romo. Not only is Barber a supreme goal line back, he can also catch the ball when Romo needs to check down due to pressure. Roy Williams (WR) Dal – Roy Williams showed he can be the explosive receiver Jerry Jones gave up a ton in draft picks to get from Detroit last year. He only caught 3 balls last week, but went for 86 yards and a score. The New York secondary is not healthy at all; last week they started the day with only 6 defensive backs active. You’ve got to know that besides Witten (who’s always a must-start in Romo land), Williams is going to be a very big target this week. He can catch the underneath stuff, but he can also go over the top for the big play. If Romo has time to throw, watch for him to look Williams way a lot this week. Steve Smith (WR) NYG – He sure looked like New York’s number one last week. He finished with 6 catches for 80 yards as Eli Manning’s security blanket. He’s not afraid to go across the middle and always makes the tough catch for the Giants. Eli’s obviously looking for him on third down, as Smith is playing a role similar to Welker’s in New England. In PPC leagues, Smith should be owned and started in most leagues. He’s not a big yardage guy, so in leagues that value that, he’s not what you’re looking for. Brandon Jacobs + Ahmad Bradhaw (RB) NYG – The Bucs were able to gash the Dallas defense for 174 yards last week by a combo platter featuring the oft-catastrophically injured Cadillac Williams and former Giant Derrick Ward. The Giants duo is vastly more talented than Tampa Bay’s, so I’d consider starting both Jacobs and his change-of-pace, Ahmad Bradshaw. Jacobs has had moderate success vs Dallas in his past three games against them (17 car/177 yd,/1 td, 14/54/1, 24/95/0) and is always a threat to score in any game that he’s healthy enough to play. Bradshaw is the better play, as he had a big game last week and is a threat in the passing game. When the ball is in his hands, he has the chance to make something special happen with his supreme speed. He’s filling the role that Ward had in New York last year and he’s much more talented than Ward ever was. I can see him seeing more time on the field this week as the Dallas defense hounds Eli all day. Sure T.O. and Jessica Simpson are gone, but did all the drama in Big D go with them? Tony Romo (QB) Dal – Not because he put up a career high last week against a Tampa Bay secondary in disarray, not because he’s “more comfortable” without T.O. on the team, and not because I think he’s a particularly good quarterback. He’s not on all accounts. The Giants pass rush is worth the hype (Osi + Tuck? Scary) but if Romo is upright long enough to throw the ball, I see Jason Garrett wanting to attack the beat-up Giants secondary. Dallas receivers not named Williams/Witten – Sure, Patrick Crayton and Miles Austin had big games last week, but it was against Tampa Bay. Crayton was targeted 6 times to Austin’s 2, but Dallas doesn’t know who their number 2 is. Crayton is atop the depth chart currently, but they really like Austin’s big-play ability. While I love to gamble, I don’t like to risk fantasy points playing roulette on who might be the guy this week. New York receivers not named Smith – I like Manningham, a lot. But he saw only 4 targets, posting 3 receptions for 58 yards (30 came on one play he extended himself). Hixon starts, but only saw 3 balls thrown his way in week one. Hakeem Nicks looked real good, but he’s out with an ankle injury. Just as in Dallas, I wouldn’t gamble on who might be number 2 in New York. Eli Manning (QB) NYG – In their last 3 meetings, Manning hasn’t eclipsed even 200 yards per game. He’s never been an accurate passer (last year was his career high at 60%) and the Giants aren’t volume passers. That’s an equation for fantasy failure if you ask me. He makes just as many mistakes as everyone else, but he doesn’t pass enough to make up for them. While he was fine last week, this week he’ll face a good defense in a rabid atmosphere. He’s easily flustered, so I’d make other arrangements this week. As with most NFC East face-offs, this should be a good game. These teams battle hard, and while Dallas has won 4 out of the last 5 regular season matchups, these games are always entertaining. Division rivals, a little uncertainty at the wide receiver positions, punts hitting the scoreboard and drama queens at QB, this game should be a good one. Add Fox’s showcasing of the stadium and the flash and flair of a Jerry Jones event, I’m sure well be treated to something great.